It is often said that we have weird place names in the UK (Cold Christmas?). As we have got further West there seems to be a generic template for road names. Montana has got this totally sewn up. To create your own you just need the following… 1. A status adjective. Examples include: Lost, Tall, Dead, Hidden, Blue or Montana favourite, Big. 2. A relevant noun. E.g. Horse, Pine, Fir, Lake, Creek, Church, Bear, Market. 3. 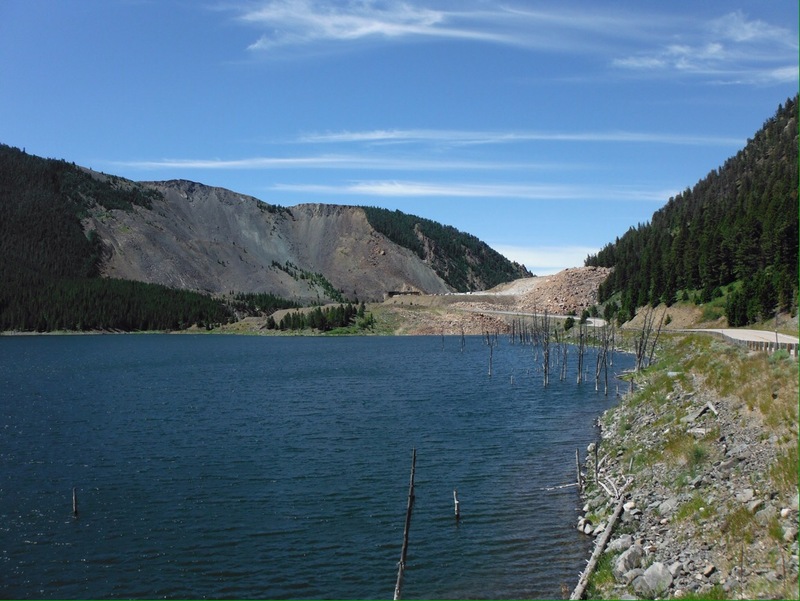 Place or geographical feature: Mountain, Hill, Forest, Pass, Valley, Ranch, anything unused from the list in 2. So you end up with something like: Lost Horse Creek Road. This makes directions very confusing. Imagine you are tired from the headwinds (yes, we still have those), probably hungry and definitely a bit sweaty. Someone is explaining that you take Tall Pine Ranch Road up to Hidden Creek Hill Trail then take the left fork at Big Fork or was it maybe Big Arm, or Big Sky? 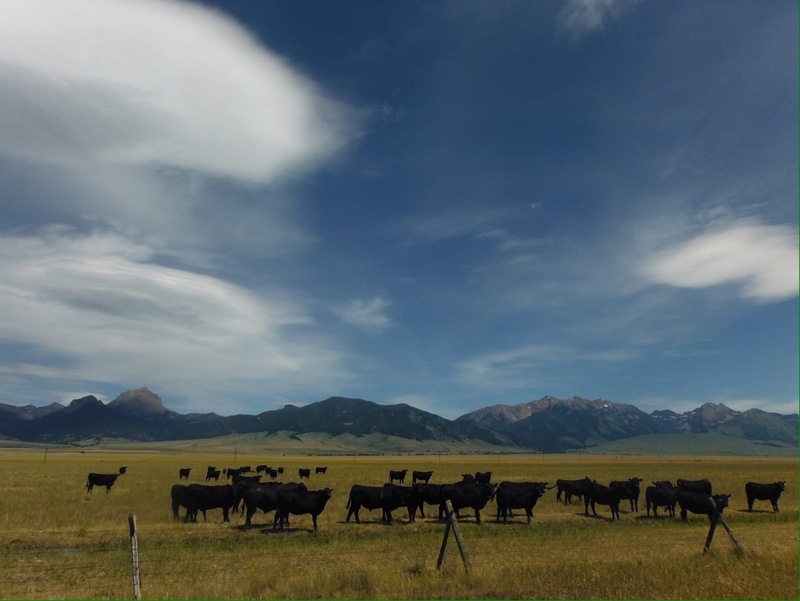 Cattle Mountain Road. Probably. Just like Montana should look. 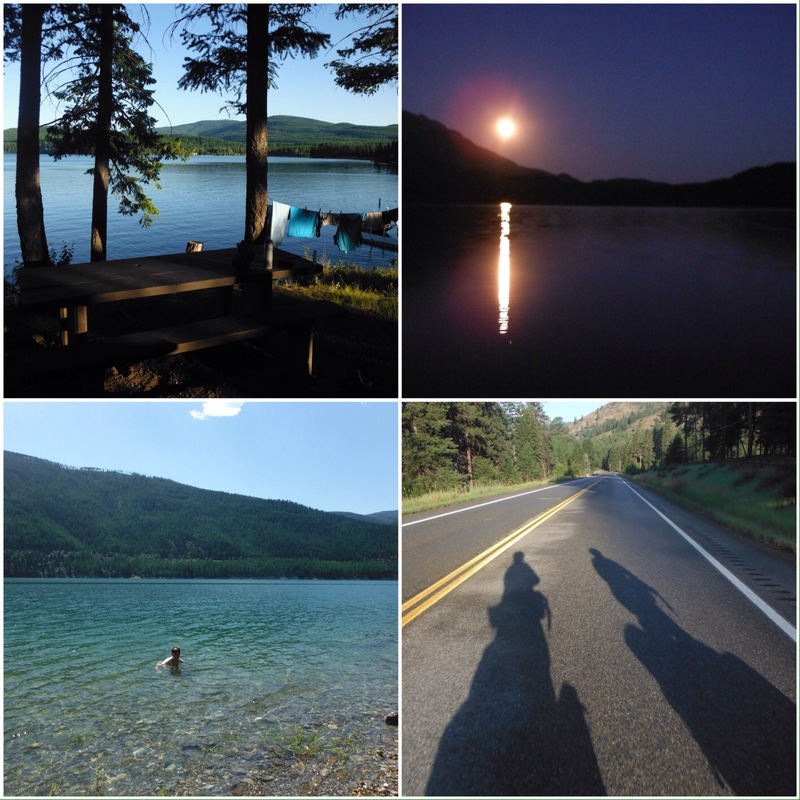 Despite these navigational challenges we had a wonderful two weeks in Montana. Like so much of the USA it is very good at being exactly like Montana should be. Our first day’s ride was alongside a lake formed after an earthquake (naming guidelines: geological incident + geographical feature = Quake Lake). The sky was blue, the trees and mountains tall and the rivers populated with fly fisherman. We kept a close eye out for Robert Redford. For the first time in ages, the wind was helpful. When we turned north it blew us to Ennis, where we camped in the backyard of a whiskey distillery and had a picnic dinner outside the public library. Living the dream. Before the earthquake, these trees used to be a forest alongside a river. The next day we had some really good apple pie. Even better, it was at a cool old bakery in a gold rush ghost town. These two days of tourist attractions and information signs were really welcome after all the emptiness we had ridden through. Sadly the helpful weather didn’t last. Despite assurances (/lies) from west-to-east cyclists that they had loads of headwinds it wasn’t at our backs again and there was the odd thunderstorm to hide from. This gave us plenty of chance for ice cream sampling while sheltering outside supermarkets. Huckleberry became the new fave. Who knew it was even a real fruit. Welcome to the Wild West. 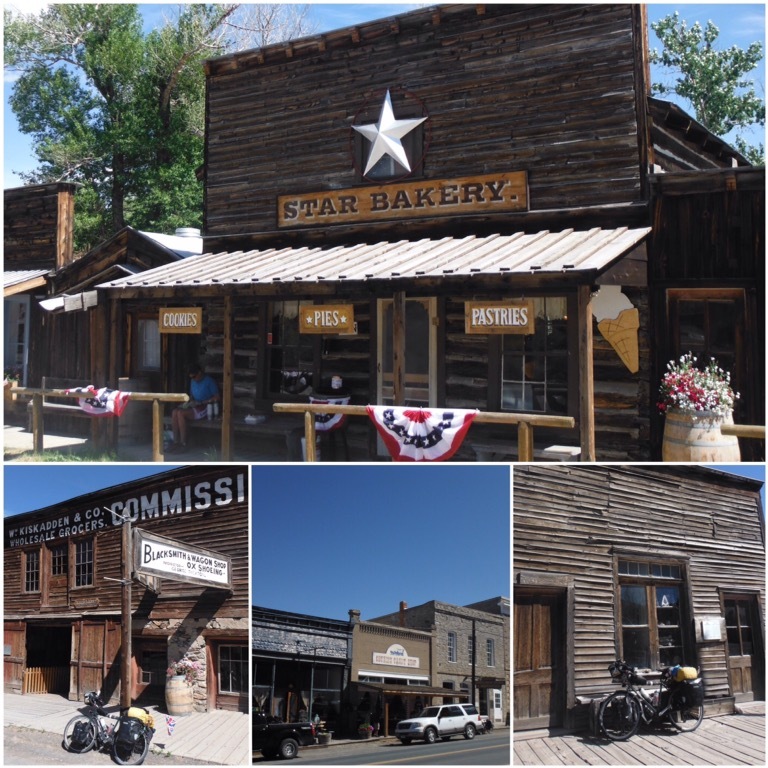 Gold rush towns Virginia City and Nevada City. We rode over a load of really big windy hills (Tall Windy Hill Road) and questioned our sanity and life choices. It was hot and the air really drying. Much like Wyoming. If you are a cycling keen bean and would like to recreate this sensation in the comfort of your own home you could try this. Ride your turbo trainer really hard on a high resistance next to a radiator whilst a few friends point their hair dryers at your face, set to high. Alternatively you can use your imagination… Say you were a grown up and drank a lot of dry white wine, maybe whilst at university when life was less sensible, then fell asleep without drinking any water, and then when you woke up the next morning you put your head in a fan oven, that would feel like cycling uphill into the wind in the western USA. Chief Jo taking a break from the hills. Our final divide crossing. We took a rest day in tiny Wisdom, watched Wimbledon and the Euro Final, and wondered if you had to live in Wisdom before you could move to nearby Wise. For a whole day we sat on a sofa, or a chair, looked outside and the rain, and ate. It was amazing. A few days later we made it to Missoula, home of the Adventure Cycling Association. We were excited about this because long distance cyclists get an ice cream and their bikes weighed. Jo was especially looking forward to it as she was convinced that her bike was heavier. In actual fact it turned out that we are packing geniuses, Jo 94lb, mine 96lb. As we had just been to the supermarket and food goes on my bike we are probably about even most days. This weight didn’t include any water, so for the metrically minded the bikes and kit total at least 45kg each. As I mentioned, questioning sanity and life choices. Clockwise from bottom left: 1. Bike weighing, a delicate operation. 2. Carrying the essentials in the bar bag. Actually a bar. 3. Our mugshot at the ACA. 4. We met a man from Rothley, Leics outside who took this one. It’s a small world in cycling. 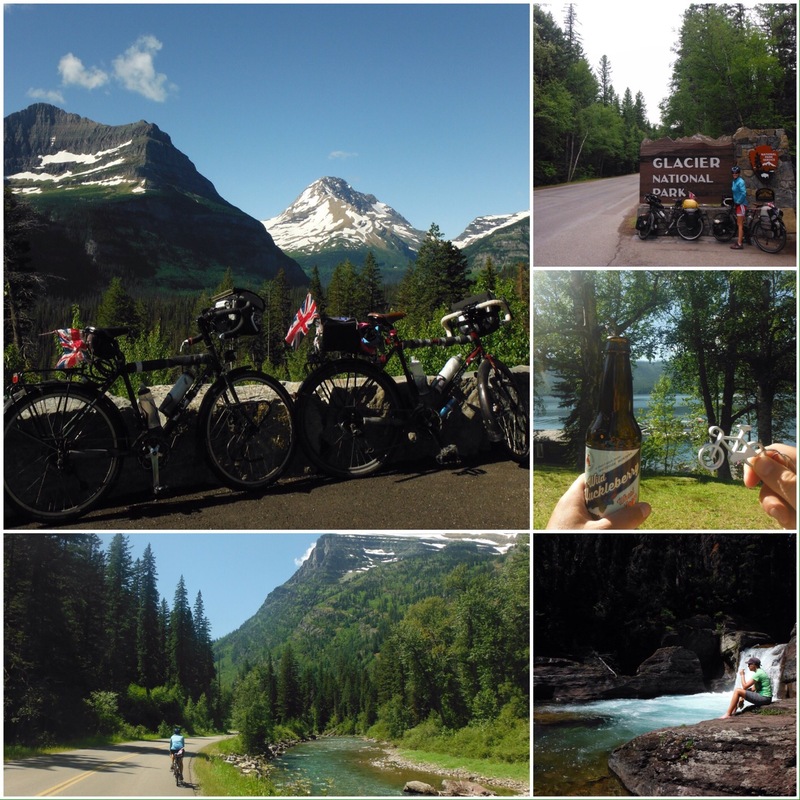 It was a few days ride to Glacier National Park. On the way we took in the Smoke Jumpers Visitor Centre and had an excellent tour. These firefighters wear kit that weighs about the same as our bikes and parachute into forest fire areas. Very impressive indeed. The awesome staff also rescued Jo’s tea flask and posted it to us in Republic, Washington. Amazing. We treated ourselves to some new gear cables and bike chains in Polson. Rock and roll. 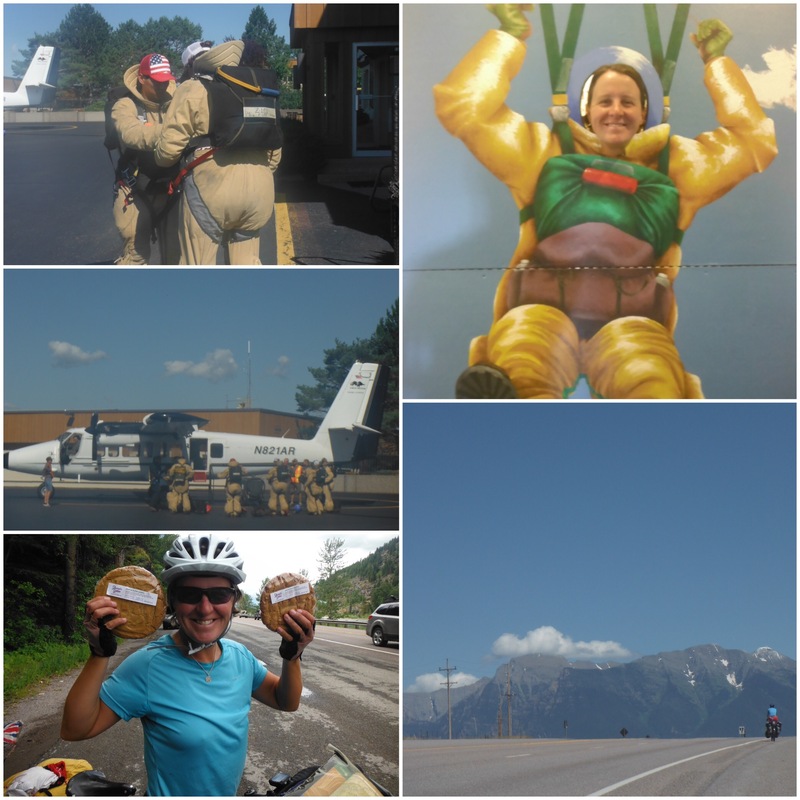 The route went along Flathead Lake where there was great swimming and even better in-season cherries for sale by the side of the road. Clockwise from bottom left: 1. Jo got some cookies as big as her face as a gift at the farmers market in Big Fork. 2&3. Real smoke jumper training jump prep. 4. Fake smoke jumper Jo. 5. Still hilly around here. Lakes instead of showers continued in the National Park, but we didn’t mind because it was probably the best place we have been in the USA. Incredible scenery, waterfalls, wildlife, lakes. 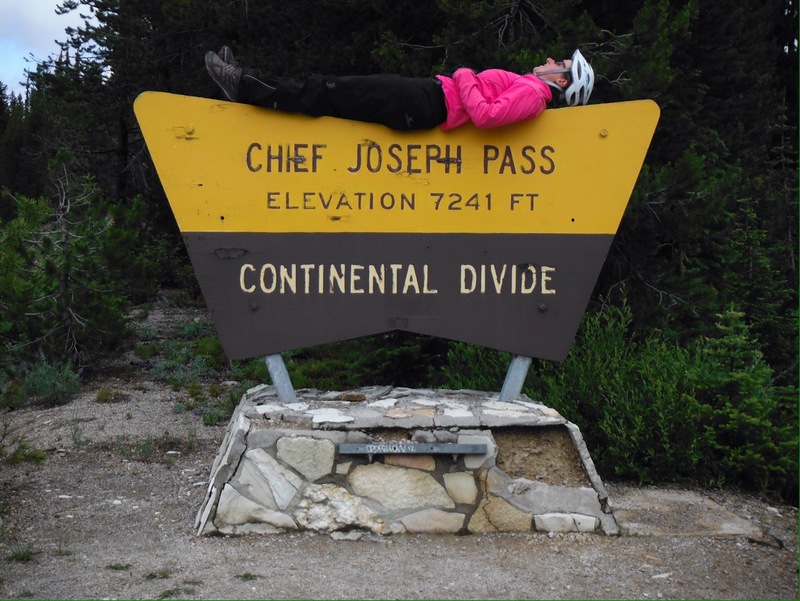 We decided to have a few ‘rest days.’ The big attraction for cyclists at Glacier is the ‘Going to the Sun’ Road. To get up to Logan Pass at about 2000m the scenic road is hacked out of the side of the mountains. As it was a rest day, we left the bags at the campground and took the shuttle bus to the top with our bikes. We rode down the East side, turned around, rode back up to the top and then down the West side to the camp ground, stopping to walk around a lake on the way. We found the perfect sports recovery drink – a Huckleberry beer (of course). You didn’t think it was an actual rest day? The next day we went for a hilly walk (hike in American) to loads of waterfalls. It was beautiful. 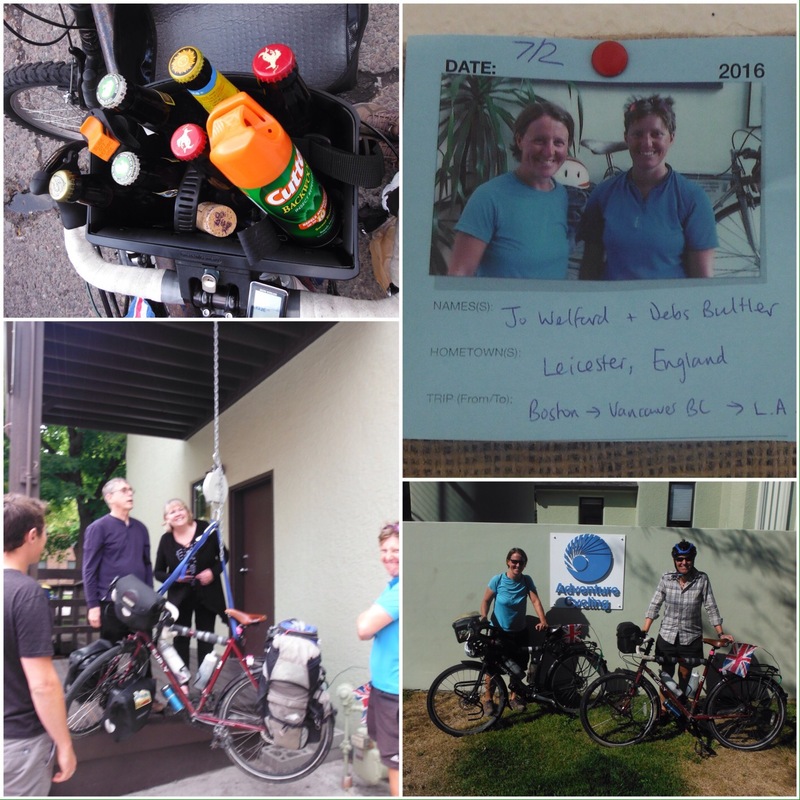 On the third day we were tired, so we decided to do 2 shorter walks and a shorter bike ride. 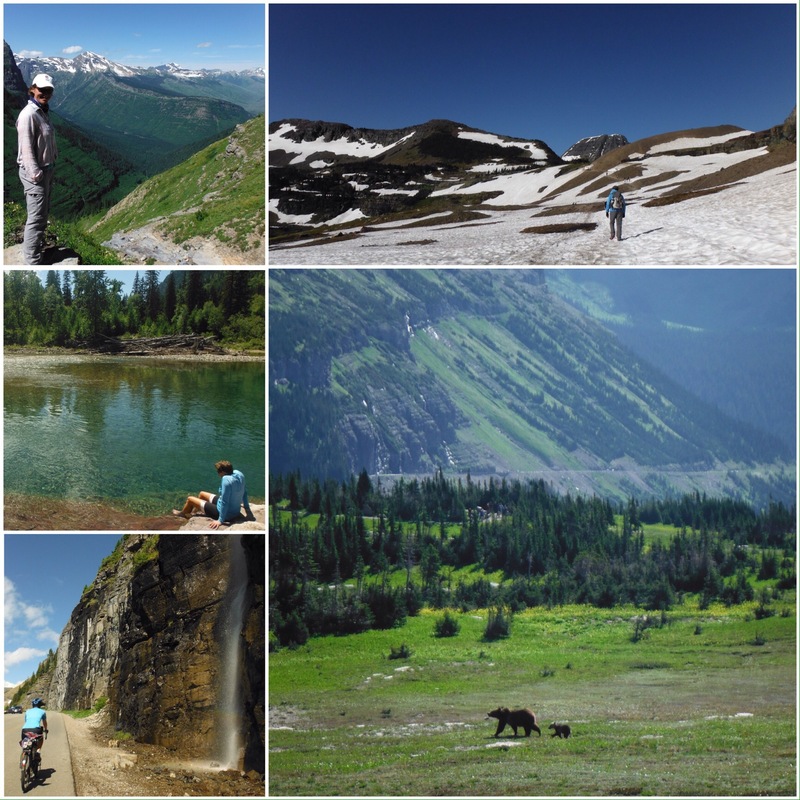 On the first walk we saw a grizzly bear and cub in the absolute best situation. We were at a safe distance, there were loads of people around and we could have outrun at least 75% of them. It was amazing. The cub gambolled around whilst mum sedately crossed the person-boardwalk. Glacier rocked. Montana had more great scenery for us before we left, but no more showers. We camped at Dickie Lake, hung out with some other cool teachers and swum in the lake for our wash. The next day was hot, windy and very pretty alongside Koocanusa Lake. There wasn’t much drinking water or shade and it was hard keeping cool. We had an essential dip in the afternoon to de-sweat. A kind Canadian family saw our heat induced fatigue and gave us some ice pops. Montana’s parting shot was our first puncture (‘flat’) of the US. After 4000 miles we weren’t too upset. Thanks to: The friendly Utah family in West Yellowstone, the vendors of the Big Fork Farmers’ Market, Tim & Carrie, Rachel & Kurt, AnnaMarie & Tom, Mike the mechanic, Suzanne & Pam for introducing us to Skipbo.